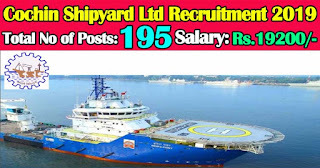 CSL Recruitment 2019 - CSL invites Online applications for recruitment of 195 Welder, Fitter, Mechanic Diesel, Painter, Electrician, Electronic Mechanic, Air Conditioner technician Posts. The applicants are requested to apply online only through Official Website www.cochinshipyard.com on or before 13.02.2019. Interested candidates are requested to peruse the advertisement regarding the process of Examinations and Interview, Eligibility Criteria, Application Fee, How to Apply, Pattern of Examination, Syllabus, Question Paper, Admit Date, Exam Date, Result Date etc,. Refer thoroughly before applying. 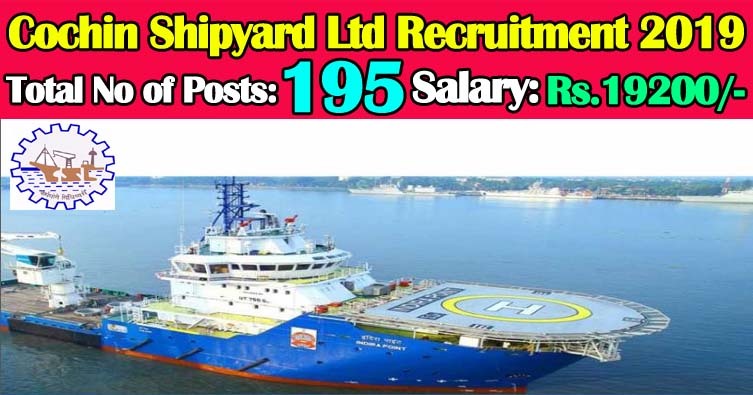 Eligible candidates can apply online through the Official website www.cochinshipyard.com from 19.01.2019 to 18.02.2019.. Before applying, Candidates should ensure that they fulfill the eligibility criteria as per published in the online advertisement.